It is very easy to sayt things. Many smaller people might have said far better things. But these become popular acroding to WHO says them. I get hundreds of such in crap forward emails everyday. The wonder is, Mr Gandhi himself forgot all these fundas when he had differences with other leaders of his time. And note that, he had differences with ALL powerful leaders of the time, like Ambedkar, Netaji Bose, Tilak, Jinnah, Bhagatsingh, Sardar Patel etc. Gandhi didnt lead us to Independence, he LAGGED us there. Without him, we wudve achieved it long ago, and without partitions etc. It was Congress propoganda who made brats Gandhi and Nehru equivalent to gods, while there were far better freedom fighters then. I do agree that Gandhi is ‘Father of Nation’… not because he created it (he didnt, of course), but because he screwed our motherland. Hail Congress propogandas, hail ignorant Indias mass, hail biased Indian media!!! According to my study and belief, Gandhiji has been the greatest statesman of all times. We, the Indians, should be proud of the fact that he was an Indian. If not all, even if we try to follow some of his values and teachings the world would be much better. Today, more than people in India, there are people outside who follow more of his teachings in countries – strangely CHINA. I have noticed this myself during my visits there. A teen-aged girl who may not pronounce his name correctly still remembers him and his name and that too with respect. Let us read more and more about him and know him better. I hope that this words will always sucked in my mind and everything i does. i am just high school student so among the quotes ,only few i understood because its quite difficult to learn and understand because some words in the sentence don’t look familiar too me..but the important is what i’ve learned…..so for now i can say that …THANK GOD…THANK GHANDI ……. this is good!!! i always love your posts! Ever so positive; I feel so gd that im on my way to change myself for the better! lookin fwd to more of your posts! This world is better place bcos of u and your lovely n encouraging posts! I am willing to accept this if you back it up with fact. 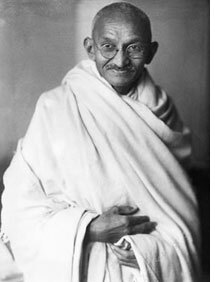 I have heard claims of racism against Gandhi (towards native South Africans), and I have heard that he liked Mussolini. All in all, he was just a man, and he has even spoken of his shortcomings as a human. His message is what endures and should be for us what we work towards as humans. I have always heard that he was vociferously AGAINST partition, and, yes, there may have been other freedom fighters, but what kind of nation is born through acts of violence and terrorism? The U.S.? It took us nearly 200 years to pass the Civil Rights Act and we’re still dealing with issues of race and class. Israel? Same thing. Ideas are much stronger than ONE individuals personal shortcomings. It help me a lot to improve my self-confidence. It’s really an amazing book.